Nigerian born Israel "The Last Stylebender" Adesanya has become New Zealand's first UFC champion after defeating Mexican fighter Kelvin Gastelum by unanimous decision at UFC 236 in Atlanta. Adesanya and Gastelum's fight lasted all five rounds, with both men visibly battered after 25 minutes of grueling UFC action. Adesanya's arm was eventually raised as he was declared winner by unaninmous decision. His record now sits at 17-0 and he is 6-0 in the UFC. He is also the tenth fighter in UFC history to win a title with an undefeated record. 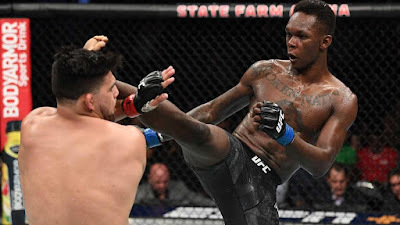 The result makes Adesanya the interim champion of the middleweight division and sets up a massive unification fight against Kiwi-born Australian fighter and current champion Robert Whittaker, who is recovering from surgery after suffering an abdominal hernia in February.